Accent Plus 5 Shelf Organizer, Decorative Tier Shelf Storage For Display Books by Accent Plus at Home Decor Outlet Store. MPN: D8-07A7-E979. Hurry! Limited time offer. Offer valid only while supplies last. 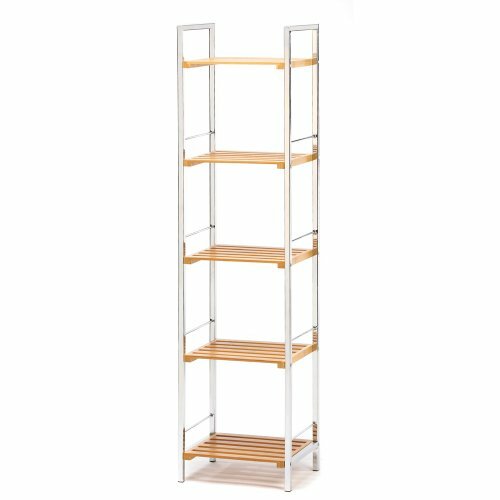 This decorative bathroom shelf wood organizer rack has gleaming chrome framework and five natural bamboo slat shelves. The book 5 shelf display stand is made from premium materials to serve you for years to come; create a truly unique experience you'll appreciate. The decorative display book shelf storage rack is a striking showplace for your favorite items; signed to help you work smarter and live smarter. This 5 tier shelf bookcase display organizer is a sleek, squared curio shelf becomes a functional work of art. Dimension of this 5 wood display storage shelf is: 13"×10.5"×50.5"; weight of this bookcase tier storage shelf rack is: 11.5 pounds.